I almost missed my self imposed posting deadline today, not for lack of ideas or motivation but because like a teenager, I’ve been obsessing about what I’ll wear to our New Years Eve celebrations. With our friends, we have booked a table for 10 in a swanky restaurant with an uninterrupted view of the Brisbane River. Apparently the view of the midnight fireworks will be spectacular. My clothing tastes tend towards the quirky; arty and individual. In Melbourne I embraced the layered look in a style that was flattering to my generous womanly proportions. In Melbourne wearing black in both summer and winter was not out of place, but in tropical Brisbane layers are too hot, black is too hot (and immediately identifies me as being from out of town) and for me any fabrics other than fine linen or silk are also too hot. Generally, what’s on offer in mainstream clothing shops lack appeal to me. I struggle with manmade fibres, bling, large florals, lurid bright colours, caftans, waistlines, hemlines and necklines. My individual style creates expectations that few retailers can satisfy, so the simple solution is to use my well honed sewing skills and ancient sewing machine to create something special for the occasion. That seemingly simple solution was the crux of my problem. I have a beautiful piece of fine silk, an intricately patterned sari length from India I find particularly pleasing and not wanting to stuff it up, the decision making seemed interminable. Cutting into that fabric was one of the hardest things I’ve done recently, but after I set my dressmaker self in motion, I breathed a huge sigh of relief and took five minutes to prepare a jar of marinated feta cheese and write this post. Marinated feta can transform a summer salad from mundane to marvellous, and a jar of marinated feta on standby forms an instant beginning to an antipasto platter. This is so simple, the most difficult part is waiting a week for the flavours to infuse into the cheese. While there are no hard and fast proportions or flavour choices, strips of lemon zest, fresh herbs from the garden, cracked peppercorns and just a hint of garlic give the most pleasing result. When the cheese has been eaten, strain and discard the aromatics and cheesy detritus from the oil. The oil will then contribute an extra delicious dimension to salad dressings or when sautéing meat and vegetables. Cut the feta into 3cm X 3cm cubes. Put a small amount of olive oil into the bottom of a preserving jar with a sealable lid. Add a few peppercorns and a few sprigs of herbs then begin layering the cheese herbs lemon zest and peppercorns. Be extra careful not to break up the cheese. Once the jar is full, drizzle over the garlic oil if using. Fill the jar with olive until the cheese is totally immersed. Seal tightly. Invert the jar a few times to release any trapped air bubbles, then top up the oil level if necessary. I can sympathize with the clothing situation. I used to wear very conservative seasonal clothing when we lived in New England. Now that we are in Florida, the stores are filled with bright tropical prints but they aren’t me. A question about your cheese…how long can it be kept in the fridge? I think our clothing climate change situations are similar and equally frustrating. Providing the cheese is kept submerged in oil it will last up to 3 months in the fridge. Thank you for letting me know, I can’t wait to make it. I really enjoyed this post. I’m mostly accused of looking frumpy, myself. But after years of having to wear pantyhose, then being pregnant twice and ending up a stay at home mother, I don’t want to wear anything tight or uncomfortable.I look for terms like “A-line” and “swing” in tops! When we moved to the country a while back to what is now our permanent home, I threw away my old sewing machine. Looking at it reminded me of our tough years – moving every two years, sewing curtains, clothes for the kids, sewing tablecloths and napkins, etc. I even worked at a fabric store so I could sew more for our family and make gifts. Those tough times are finally over, but I went out recently and bought myself a nice, much more modern sewing machine. I’m no dressmaker, but it’s nice to know how to sew, and can when I want to! I always enjoyed sewing and made all my kids clothing then looking to challenge myself I learned pattern drafting which allowed me to push my style beyond what was available commercially without breaking the bank. I love clothes but can’t bear to be uncomfortable either. Good luck with the new sewing machine. Mine was a 21st birthday present from my parents. It has sewn millions of kilometres and has never missed a beat. I’d be devastated if it broke down because I don’t think there would be parts available now to fix it. Oh my goodness! Probably not! The feta recipe is so simple and ‘tastes’ so great it is already on my ‘holiday’ list! Must admit to a big smile that after decades of being a rather fashionable Eastern Suburbs gal in Sydney, I now very happily live in jeans, crazy tops, loose kaftans, sarongs and the like! Just one ‘practical’ suggestion for those domiciled in Australia/ I buy absolutely e’thing on line, and, after years of practice, very successfully. There is a rather fun link to ‘hardtofind’ I use rather oft: many small or private clothes firms have some fun and different gear to show. Have bought from Darwin and Broome and all places north and south, usually with happy results . . . . 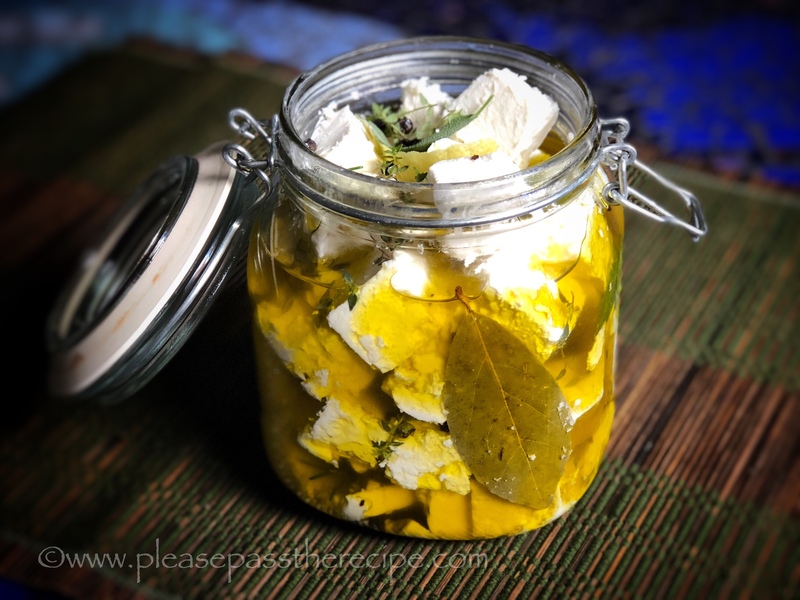 Very amusing that you take a calming break by making marinated feta – a great standby, by the way. Hope the dress worked out. I know exactly what you mean. While in the UK, I lived in jeans. Here in Athens, warmer climates necessitate a very different wardrobe + we have a lot more social obligations, so frocks, heels, etc. I prefer tailored or simple things in good fabrics, but the Greek shops are bling-happy and I cannot see myself wearing sequins… Without your sewing skills, It’s the internet for me. Sounds like Athens and Brisbane have similar tastes. Definitely a challenge. I haven’t had much luck over the net. Must be the hot weather that brings out the bling! Marinated feta is good, very good in fact but a photo of you in your new outfit would be wonderful. You have us all curious now. The feta look s great. I will be doing this, than you. I make all my own clothes out of linen and cotton for summer. I used to have a shop in the Brisbane Arcade until we bought our house in Italy. I still do the occasional Pop Up shop where I make and sell pure linen and cotton clothes for women who want something individual. I have just finished a Pop Up but there will be another in February. I find silk too hot for Brisbane summers. I write a post about my Pop Ups on my blog. I will do that again in February. I love this recipe. Can I share it on my blog please? If I press the ‘share’ button it seems to have all your info and details and links etc. Just let me know before I do it though please – I don’t want to upset anyone! Now that’s another great summer standby that I also do. But I no longer sew. And I have the exact same list as you when it comes to clothing styles and fabrics that I don’t wear. And quirkiness too. So I am VERY excited to see what you make. Cutting into that piece of collected sari must have been a terrifying moment. Please share your creation. I need to know how to dress and have lost all hope of finding anything suitable to wear anywhere. Do show the frock, when done, please. I know you only use PP the recipe for food but maybe you could show the creation, the add a little recipe afterwards…. I hear you on the whole issue of trying to buy a ready-made outfit that suits my short, curvy body! Interesting that natural fibres don’t suit you, because cotton is about all I find comfortable in hotter weather. I hope our daughter never decides to marry because I will probably drive myself insane trying to find something to wear…and don’t get me started on shoes… the marinated feta looks and sounds delicious. I must try that one some time. Have a good festive season Sandra. Linen is my first fabric choice for the hotter weather Ardys, but it’s hard to make it look dressy. I think despite the procrastination I’m now on the right path. Oh, and I hear you on the shoe front too. Do try the feta…. This entry was posted on December 14, 2017 by ladyredspecs in Cooking, Food, Pantry Essentials, Preserves, recipes, Side Dishes & Salads, Snacks and tagged antipasto, cheese, feta, marinated feta.